Fox is keeping Riggs and Murtaugh around a bit longer as Fox has announced second season renewal of Lethal Weapon. I have said on numerous shows and articles that I am not fond of movies being adapted into TV series as they tend to lose what the films special during the adaptation. Lethal Weapon has proved me wrong for the most part and I have been impressed with what Fox has created. The weekly adventures of Riggs and Murtaugh on the small screen capture a lot of the elements from the Lethal Weapon films but also carve out their own niche with some solid storytelling. The biggest change is the portrayal of Riggs in the series who is definitely in a more psychologically damaged headspace than his big screen counterpart. The Fox series has crafted something different that still maintains what made the films so fun. Let's hope season two keeps up the great work. FOX has ordered a second season of the hit action drama LETHAL WEAPON, it was announced today by David Madden, President, Entertainment, Fox Broadcasting Company. LETHAL WEAPON delivers a total Multi-Platform average audience of 11 million viewers and ranks among the Top 5 new series this season. 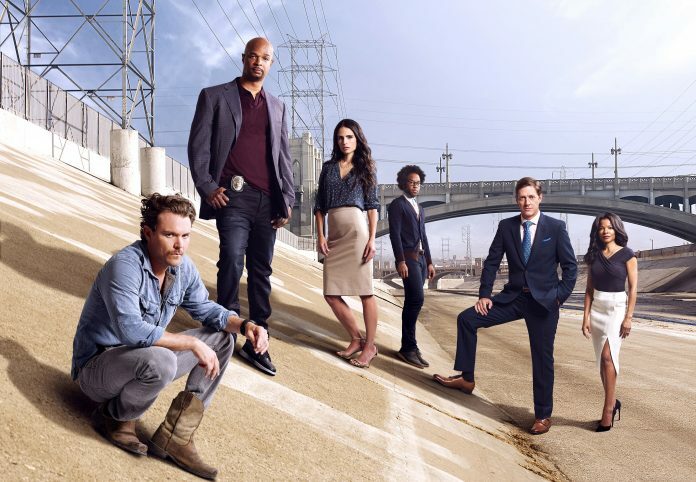 In tonight’s all-new episode, “Unnecessary Roughness,” airing [8:00]-[9:00] PM ET/PT, on FOX, a murder involving a high school football phenomenon draws Riggs (Clayne Crawford) and Murtaugh (Damon Wayans) into the lucrative – and corrupt – world of college recruiting. Meanwhile, Murtaugh considers a big change in his professional life, and Riggs contemplates an even bigger shift in his personal life, as he spends more time with DEA Agent Karen Palmer (guest star Hilarie Burton). Combining action and drama with ride-or-die friendship and humor, LETHAL WEAPON reimagines the hit movie franchise, as it follows classic cop duo Riggs (Clayne Crawford, “Rectify”) and Murtaugh (Emmy Award nominee Damon Wayans, “My Wife and Kids,” “In Living Color”), who work a crime-ridden beat in modern-day Los Angeles. Grief-stricken after the loss of his young wife and unborn child, ex-Navy SEAL-turned-detective MARTIN RIGGS moves to California to “start over” at the LAPD. He’s paired up with ROGER MURTAUGH, who’s just coming back to the job after a near-fatal heart attack. Riggs’ penchant for diving headfirst into the line of fire immediately clashes with Murtaugh’s prudent, by-the-book technique. One has everything to live for, the other has nothing to lose. LETHAL WEAPON is a production of Warner Bros. Television in association with Lin Pictures and Good Session Productions. Matt Miller (“Forever,” “The 100”), Dan Lin (“The LEGO Movie,” “Sherlock Holmes”), Jennifer Gwartz (“Forever,” “Veronica Mars”) and McG (“The Mysteries of Laura,” “The O.C.,” “Charlie’s Angels”) serve as executive producers. The pilot was written by Miller and directed by McG. “Like” LETHAL WEAPON on Facebook at facebook.com/LethalWeaponFOX/. Follow the series on Twitter @LethalWeaponFOX and join the discussion at #LethalWeapon. See photos and videos on Instagram by following @LethalWeaponFOX. All episodes of LETHAL WEAPON are available on FOX NOW, Hulu and On Demand. To watch episodes on FOX NOW, visit https://fox.tv/watchlethalweapon.